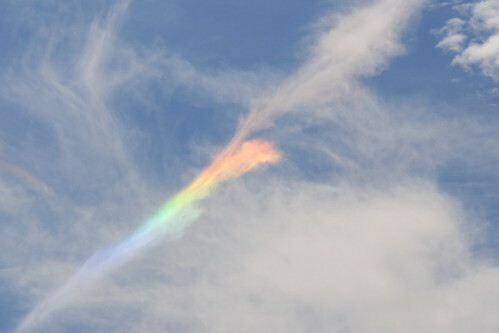 "A circumhorizontal arc or circumhorizon arc (CHA), also known as a fire rainbow, is a halo or an optical phenomenon similar in appearance to a horizontal rainbow, but in contrast caused by the refraction of light through the ice crystals in cirrus clouds. The phenomenon is quite rare because the ice crystals must be aligned horizontally to refract the high sun. The arc is formed as light rays enter the horizontally-oriented flat hexagonal crystals through a vertical side face and exit through the horizontal bottom face. It is the 90° inclination that produces the well-separated rainbow-like colours and, if the crystal alignment is just right, makes the entire cirrus cloud shine like a flaming rainbow."